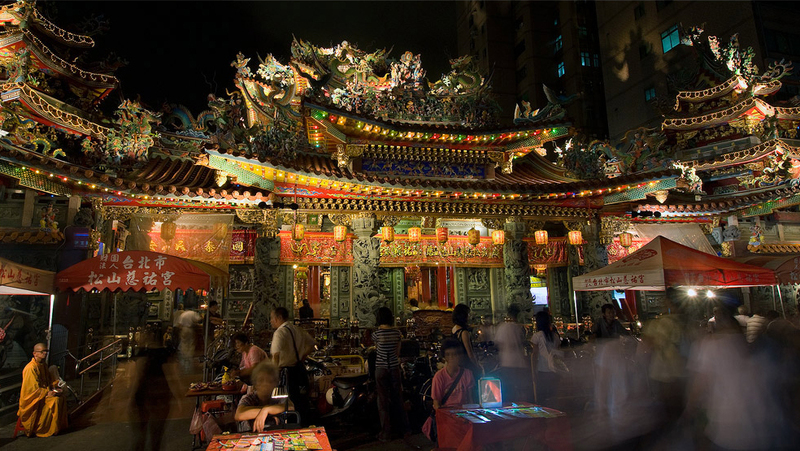 This temple, built in the mid-18th century, is the cradle of development of the Songshan district. The story goes that a monk once roamed this area, carrying a gilded image of Mazu, Goddess of the Sea, as he begged for alms. One day at Xikou- the old name for this district- the monk came upon a number of people, all Mazu believers, from his old home. Together they planned construction of a temple to honor the goddess, and after raising funds for more than 10 years they were able to realize their dream. Construction started in 1753 and was completed in 1757. The top of the temple roof is richly ornamented; in addition to human figures, there is also a flying dragon placed there because dragons were believed to have the power to prevent fires. Inside the temple are layer after layer of oil lamps lighted by devotees in the hope that Mazu will grant their wishes. The side altar to the right of the Mazu image enshrines the Earth God, who is protected on either side by flag-gearing Tiger Lords. The side altar to the left is devoted to Zhusheng Niang-niang, the Goddess of Birth. This goddess is normally accompanied by 12 female aides, but here she has 13. The extra aide is Duyu Niang; in life she was a midwife who never accepted money for helping women with childbirth, so after death she was deified because of her kindness and skill. Nat'l Hwy 1 → Neihu Interchange → Sec. 2, Chenggong Rd. → Xinming Rd. → Chengmei Bridge → Sec. 3, Nangong Rd. → Sec. 4, Bade Rd. Take train to Songshan Station.